Bhutan knows several climat zones, ranging from alpine with eternal snow in the mountains to temperate in the center of the country to subtropical in the south. The climate can be quite unpredictable, even within a day or from one day to another. In the Thimphu and Paro valleys, the winter daytime temperature averages 15°C during clear winter days but drops well below freezing during the night. You can expect light snow fall there, alternated with infrequent heavy snowstorms. Mid December to early January can be a beautifully clear and dry time in Western Bhutan. In the higher elevations late December through mid February is the period of heaviest snow fall. During the summer, the fluctuations are less; daytime temperature often rises to 30°C. Usually Punakha and the central valleys are a few degrees warmer. The Himalayan higher peaks are snow covered all year long and because of frequent snow fall, the road ices up at the higher passes, particularly around Thrumshing La. From May to late September summer monsoon affects Bhutan. From June to August you can expect clouded views over the Himalayas from the higher passes. The wet season does have its advantages though, because from March through May the valleys have beautiful shades of fresh green and only in springtime you can see the spectacular rhododendron in full blossom. In August many species of wild orchids are in full bloom. September through November are usually very mild and clear, with sharp clear skies and magnificent views of the Himalaya range. 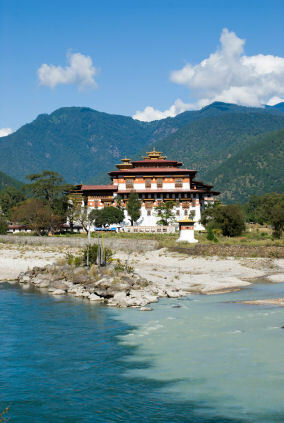 Although each of Bhutan’s seasons has its' advantages and disadvantages, the spring and fall are traditionally the most popular times to visit the kingdom.